When seventeen year-old Alex finds an unusual looking bracelet while she tries to rescue a swan caught on wire on the banks of the Thames, she thinks nothing of wearing it. It’s so pretty, and so unusual. But soon strange things start to happen: the apparition of a young man wearing a cloak keeps popping out in front of her, and soon he is speaking to her too. It turns out he is called Callum, a young man drowned in the Thames and caught in a half-life, between life and death. As Alex and Callum get to know each other, Alex learns more about the Dirge, Callum’s people, and his sister Catherine. But as he reveals more of his secrets and they fall in love, danger creeps closer and closer. Is he telling her everything, and can she really trust him? Small Blue Thing is a well-written, well-paced and intriguing début novel from Sue Ransom. There is a real sense of build-up in the narration. When we meet Alex, it is first within a very normal and familiar setting: school, going out, boyfriends and best friends are her main priorities. As the amulet (as the bracelet turns out to be) starts to work its magic, the story becomes darker and more pacey. It is nice to see a supernatural romance set in England at last, and it is particularly important in this book as there is a very strong sense of place in Small Blue Thing. In fact, for me it was one of the things that made it so special. The author wanted to write a story for her paranormal romance fan daughter but wanted to set it in and around London, and to include some of her favourite places. It really shows; there is a lot of love in this book for some specific places: St Paul’s Cathedral of course, but also Blackfriars Bridge, the banks of the Thames in Richmond, Hampton Court, Kew Gardens all take centre stage … London plays such an important part in this book, it feels like it is a character in its own right, just like Alex and Callum. Alex is a great heroine; she can be vulnerable but more often than not she shows real strength of character, especially when dealing with ladykiller Rob! I wish he’d got his comeuppance at the end (a little haunting will have done him some good) and I am hoping bad karma will come his way in the second tome. But he was a great baddie, the kind you love to hate! Catherine was also a well thought-out, ambiguous, character; to the very end, I was in doubt which side she was on. I didn’t find Callum particularly dashing I have to admit, but I think his and Alex’s falling in love was quite credible. Considering how many new paranormal romances are published every month, Sue Ransom’s concept of the Dirge is quite an original creation and will make it stand this story out (the incredibly pretty covert will certainly help too, and there is not a hint of black, white or red in sight!). There are similarities with many supernatural romances, and more particularly Twilight: Callum, like Edward, struggles with the nature of his affliction and particularly the lack of morals behind his feeding habits. We also witness Alex going through similar emotions to Bella’s: incredulity, doubt, disbelief in her own attraction, infatuation, to name a few. But I am not sure this can be avoided in this genre. After all, whether your boyfriend is a vampire, wolf, zombie, ghost or a Dirge, you are going to run into similar difficulties when trying to work out the relationship! So it is by no mean a criticism. And thankfully Alex wasn’t as whiny as Bella! The twist at the very end is just incredible and utterly unexpected. I so did not see that coming! The great thing is that it leaves so many questions unanswered that you will feel compelled to read the second tome. I cannot wait to see what happens! This a great first offering from new independent publisher Nosy Crow. 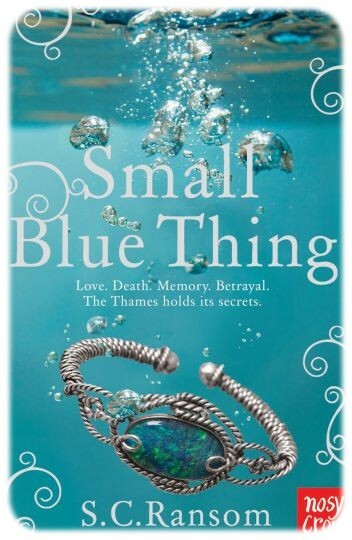 Small Blue Thing will appeal to supernatural romance fans yes, but I do hope it is not “shelved” as just that. With an unusual storyline, some great characters and enchanting, beautiful London at its core, it is simply a great story. (And of course, I cried, but I am not telling you why because it will spoil some of the story!). I want it ! I also want to cry ! You cried? I didn’t see that coming. I am intrigued. I am not really in the mood for paranormal right now but I love the fact that this is set in London. Great review.